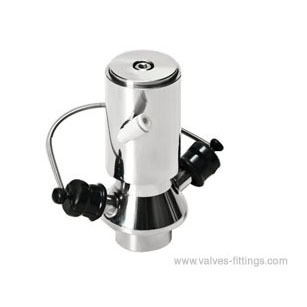 AV-7PA series is a stainless steel aseptic sampling valve with pneumatic actuator; it is wildly used in the food, dairy, brewery, winery and many other hygienic industries. Pneumatic aseptic sampling valve is made from four parts: valve body, valve head, a pneumatic actuator and one piece of diaphragm. A rubber diaphragm valve is put at the axis of valve head, acting as an extensible valve core. End connections can be welded, clamped or threaded, only one size DN8 available. Max. sterilization temperature: 130°C, dry steam: 121°C (2bar). Steam must be dry, because condensed water will damage the diaphragm. The diaphragm should be replaced after 100 times samplings or sterilizations.